Every morning, the fine folks at Sports Radio Interviews sift through the a.m. drive-time chatter to bring you the best interviews with coaches, players, and personalities across the sports landscape. Today: Leave Samantha Steele out of it. 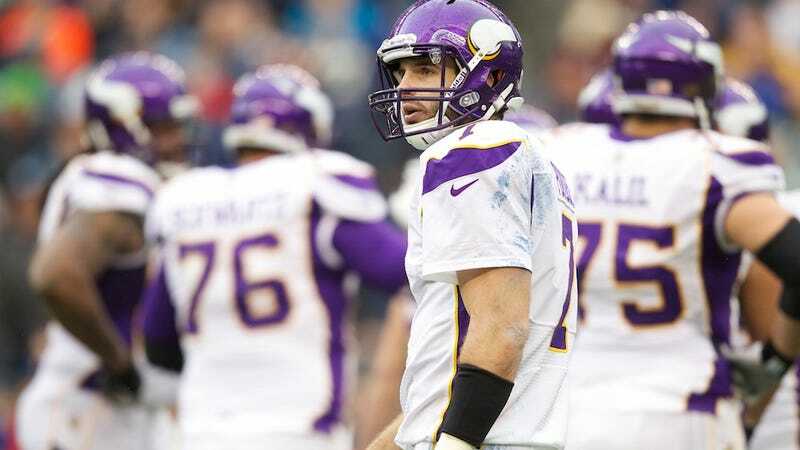 Christian Ponder joined Paul Allen on KFAN in Minneapolis to discuss his performance against Seattle, his recent struggles, dispelling the notion that his attractive girlfriend is affecting his performances, why he wouldn't have benched himself against the Seahawks, the pressure he puts on himself, Adrian Peterson's hot streak and Percy Harvin's injury. "It felt good. Good thing is we ended up scoring a touchdown on that drive, so it's all good." "Yes, we can. And we will, for sure." "I'm a competitor, and the worst feeling in the world is to lose. I never want to feel that again and so I'm going to do everything I can this week to make a big progression. We watched on film; everything's fixable. The whole offense can get a lot better and we can do a lot of things to get better, and we will. Everyone hates that feeling and no one wants to feel that again, especially this week. This is extra motivation for us because it is back in the division against Detroit, who obviously we won against before, but they're getting hot right now and they're getting better. They're probably a better team than we faced earlier. We don't want to lose three in a row, especially going into the bye week, so I think there's extra motivation this week to get out and - obviously for me - to perform a lot better than I did the last three weeks." "She has nothing to do with it. We've been dating since the beginning of the season, so she had also to do with the five wins. So it has really nothing to do with anything on the football field." "No, I don't think so. … Yeah, I wasn't performing well and the whole offense wasn't performing well, but knowing the position and knowing what it takes, I think in the middle of the game, to pull the quarterback is definitely a tough situation. And we were still in the game, so no, I definitely wouldn't have pulled myself." "No, no. I put a lot of pressure on myself but I think I've grown used to dealing with that pressure so … I don't think it's too much. I don't think it's something that negatively affects me." "It's unbelievable. It's interesting - the first part of the year we weren't running the ball really well but we were throwing the ball all over the place, and now we're running the ball all over the place [but] not throwing the ball very well. So it's important for us to get both those sides clicking. And we will, but Adrian's running the ball extremely well. Some of those runs that he had were unbelievable. … That's a quarterback's best friend, to have such a great running game. It's my job to get the passing game going." "Obviously he's a big part of this offense, but if he can't, obviously we want him healthy - that's the most important thing. We'll figure out ways to do without him. And obviously Jerome Simpson's a guy who had a big game against Detroit last time we played them. So we'll need him to step up." • Vince Carter still has love for Toronto. • Doug Martin is representing Boise State. • J.J. Watt is out for blood.